Welcome to our new column, “For the Love of …” where we interview culinary artisans who’ve followed their passions away from traditional careers and into the world of entrepreneurship. During January and February, as we focus on Wellness + Love, we’ll highlight makers in the wellness world. Of all the fizzy tonics and gut-healing drinks out there, kombucha has stolen our hearts. We admit: For the uninitiated, it can be a tough sell. Tangy fermented tea might not sound like the most appealing thing to sip, but we’ve seen it happen over and over again — once they try it, even skeptics are hooked. Effervescent, sweet-tart, endlessly customizable in terms of flavors, and wondrously restorative for gut health, “booch” is the reigning queen of the wellness beverage world. The kombucha trend has gone full-on mainstream, with national brands on the shelves of supermarkets and on the menus at many bars, breweries and restaurants. Pennsylvania is home to an impressive number of kombucha artisans, and a name we’ve been seeing around more frequently over the past few years is Natalie’s Craft Kombucha. 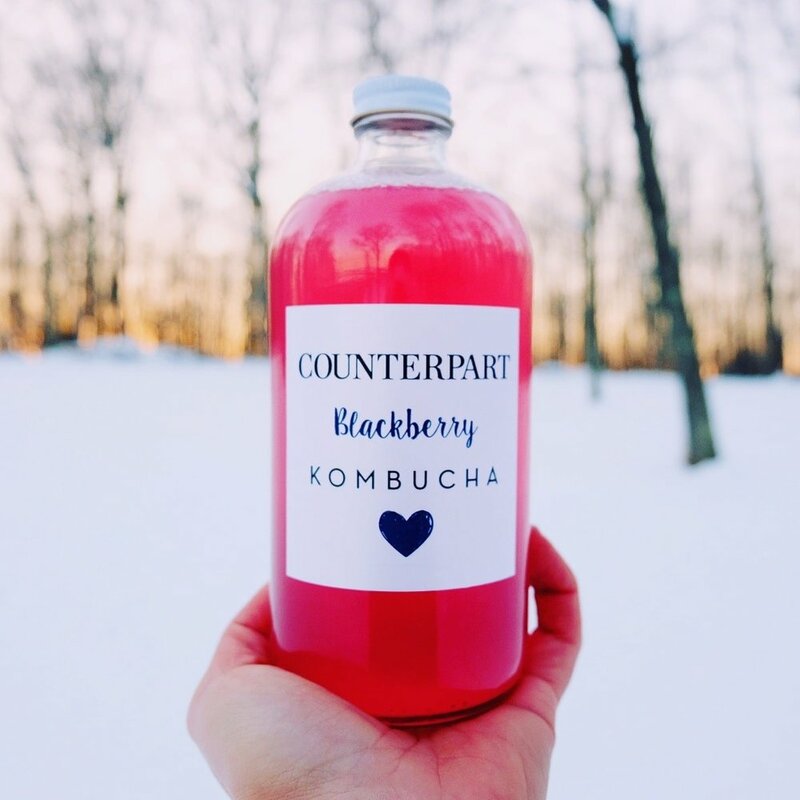 With pretty packaging, inventive flavors and a good-sized Instagram following, Natalie’s seems to have tapped into the stylish, trend-forward vibe of kombucha (versus the health food/hippie vibe), and the more we looked into her brand, the more curious we became and the more we wanted to learn more. Who is Natalie, we wondered, and how did she find her way into a career in kombucha? The Town Dish: Can you give us a brief history of your company? Where are you located? Natalie Lynn: I started Natalie’s Craft Kombucha (which is now Counterpart Kombucha) in my mom’s kitchen. I had been fascinated by Kombucha for years and loved the effects it had on my body, but didn’t really love the taste. Once I started making it, I quickly became obsessed with managing the different elements to make it both full of healthy bacteria and taste really good, too! That was a little over four years ago. I started in Bloomsburg, Pa. and am just now moving to Drums [Ed. note: about 25 miles south of Wilkes-Barre]. The Town Dish: Is kombucha a full-time gig for you now, or do you have other work? Natalie Lynn: This is my full-time gig! After about six months of home-brewing I took the leap into doing this full-time, one of the best decisions I’ve ever made. There’s something to be said for being well established before you do something like that, but for me, the pressure was a good thing that really motivated me. The Town Dish: Was there a specific moment that you decided to go for it with Natalie’s Craft Kombucha? Did it feel risky? Natalie Lynn: It very much started purely out of interest for the product. I had no intention of selling it, that hadn’t crossed my mind. When I realized how much I had left over every week from all of the different experiments with flavors and processes, I decided to see if anyone wanted to buy it. As soon as I made my first sale, which was in the parking lot of a gas station, I realized how much I loved the idea of sharing it. That day I decided to keep making more, and hopefully to sell more! It definitely felt risky, and it was a tough decision at the time, for a lot of reasons. Starting anything new is scary, as there is no promise of longevity or success. Also, at the time, kombucha wasn’t well known outside of bigger cities. It took me a few weeks to really muster up the courage to quit my job and pursue this full time. The Town Dish: What are some challenges you faced when starting up? How about some victories? Natalie Lynn: Challenges are a part of the job. I say that to myself literally every day. At first the challenge was to educate my customer base on what kombucha is, and why they may not only love it but really benefit from it. As of late, I’ve been faced with the challenge of changing my brand name, which is now Counterpart Kombucha. Having my name be the brand name has been so important to me from the start, but I’ve had to roll with this, and that has surely been a challenge. The victories have all been because of my customers, the “Boochfam.” I don’t know how I got so lucky, but I have an amazing tribe of people who support me and my beloved kombucha. The Town Dish: What have been some of your biggest learning moments? What advice do you have for someone starting out as an entrepreneur? Natalie Lynn: My biggest learning moments have happened in every facet, truly, and very much relate to the challenge question. In the world of business, there are all kinds of unknowns, and as you grow, those do, too. I was definitely surprised to receive legal threats about using my name, that was one of the most surprising moments of my life. When you’re a small business, you’re vulnerable in many ways, and that is just one. My advice to anyone starting out would be to make sure the passion is there. When you love it, even the longest days are worth it, and there will be many. When you have the passion and love for what you’re doing, it becomes something else to you. You’ll be surprised and shocked and challenged all along the way, but the love you have for it will keep you going! The Town Dish: What do you see happening for the future of kombucha? Natalie Lynn: It’s an interesting time for kombucha right now because it boomed so quickly. As far as regulations and labeling requirements, there is a large grey area which can make it confusing to consumers. For true kombucha lovers, supporting the small kombucha brewers is important because they are the ones who are making traditional kombucha. It’s amazing that the industry has grown as it has, but it has definitely created a “new” kind of kombucha that differs from the original in a few ways. Some larger corporations that have come into the market are pasteurizing the product and then adding probiotics into it, which results in a very different product.